Dental implants from your Brampton dentist restores appearance, function and much more! Tooth loss forces you to consider your options for replacement. The loss of even one tooth can have a dramatic effect on your overall oral function. When a tooth is lost the adjacent and opposing teeth can drift into the missing space. This can alter your bite, speech and you may start to favor one side of the mouth when you chew, causing imbalance in your jaws and jaw muscles. Also, depending on the location of an empty space, the appearance of your smile may be affected. Fortunately, there are several methods of restoration available today. One that we discuss with our patients is dental implants. Implant treatment has been a significant development in dentistry. An implant is a small titanium post that looks similar to a small screw. In a minor procedure, one or more implants can be placed in the jawbone. Here, the titanium post takes the place of the natural root. This is possible through the process of osseointegration in which bone tissue grows around the implant and it becomes fully stabilized in your jaw, capable of lifelong function. 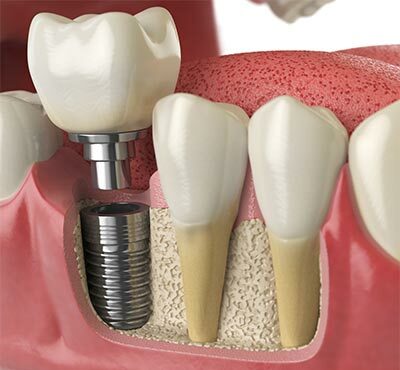 The implant serves as a root anchor for tooth replacement by a crown (cap) or a bridge. These crowns or bridges look and feel just like your own natural teeth. Implants can also be used to anchor dentures that are loose. Missing teeth can be replaced by a conventional bridge, partial or complete dentures, or implant supported crowns and bridges. The advantage of implant supported crowns and bridges is that teeth on either side of the empty space do not have to be altered in any way, unlike conventional bridges or partial dentures. Only the implant area needs to be restored, everything else remains the same in most cases. Implants also take the place of roots. Because they are situated in bone tissue, just like natural roots, they transfer the force to the bone when you chew. This stimulates bone to regenerate, a process that stops in the absence of roots or a viable replacement. Conservative replacement, does not require alteration of natural tooth structure to support an artificial tooth or teeth. Upon final restoration with a crown or bridge, chewing and speaking function feel very natural. Excellent support for full dentures can be gained with just a few implants. The regeneration of bone stimulated by implants minimizes the risk of significant bone loss, which can affect facial contours. A dental implant replaces the root of a missing tooth, for a restored smile that looks completely natural. With a success rate of 95 percent, dental implants are quickly becoming treatment of choice for missing teeth. This short video, brought to you by Dr. Deepak Joshi at Kensington Dental explains the process. We are proud to offer each of our patients the high standard of dental care they deserve. To Learn More About Dental Implants And Your Options For Tooth Replacement, Contact Our Office.